Not One is a dice game played against the computer. Each player in his turn rolls the dice. The player scores the total of the numbers showing on the dice and may end his turn with that score or roll again. The player may roll the dice as many time as he wants adding the totals to his score. 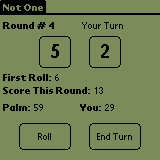 However, if he rolls the same total as the first roll, all points scored in that turn are lost and play passes to the next player. The player with the highest score after ten rounds wins. In order to compile Not One from source, you will need prc-tools (version 2.0.92 or later), pilrc (version 2.8p6 or later), the PalmOS SDK (version 3.0 or later) and make. Copyright © 2001 Brian Sulcer. All rights reserved.